The Riverside Motor Lodge was situated for many years on the Parkway next to Smokyland Motel and behind Shoney's and the small strip of shops next to it. The photo on the left shows that to the left and in fron of Riverside Motor Lodge was Smokyland Motel. The photo on the right shows that to the right and in front of Riverside Motor Lodge was Shoney's Restaurant. Two photos taken from the Space Needle. The one on the left, which is probably from the early 1990's, shows that Smokyland Motel at one point was called the Quality Inn. The photo on the right, which is more recent, shows that both hotels were still in operation into the 2010's. The photo on the left shows the old sign on the Parkway for Riverside Motor Lodge. The photo on the left shows that the sign has been transformed into a sign advertising parking after Riverside Motor Lodge was demolished. Shoney's soon followed suit by closing and having the building demolished and the property turned into a parking lot. 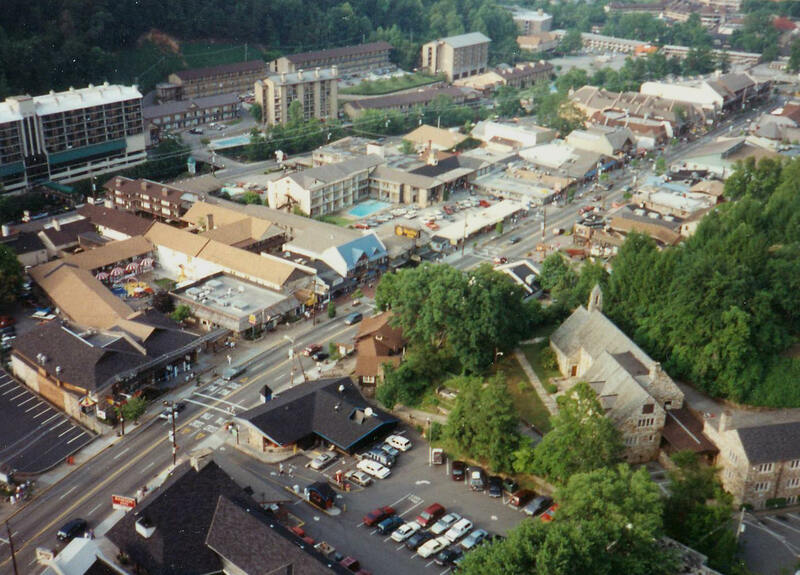 I beleive that when it closed, Riversidem Motor Lodge was the oldest operating accomodation in Gatlinburg and Shoney's was the oldest operating restaurant in Gatlinburg. The photo on the left shows Foster's Coutnry Store. It was located in the vacinity of the Convention Center. It lasted into probaly the early 1990's. It had a lot of souvenir type items like Rebel Corner as well as other things such as pottery. The photo on the right shows the second location of Rebel Corner. This one was on the same side of the street as the original and about as far north as Ober Gatlinburg. I believe this one actually outlasted the original by a year or two. After it went out of business, Park Place was in the building for several years. It has since been turned into three smaller shops. 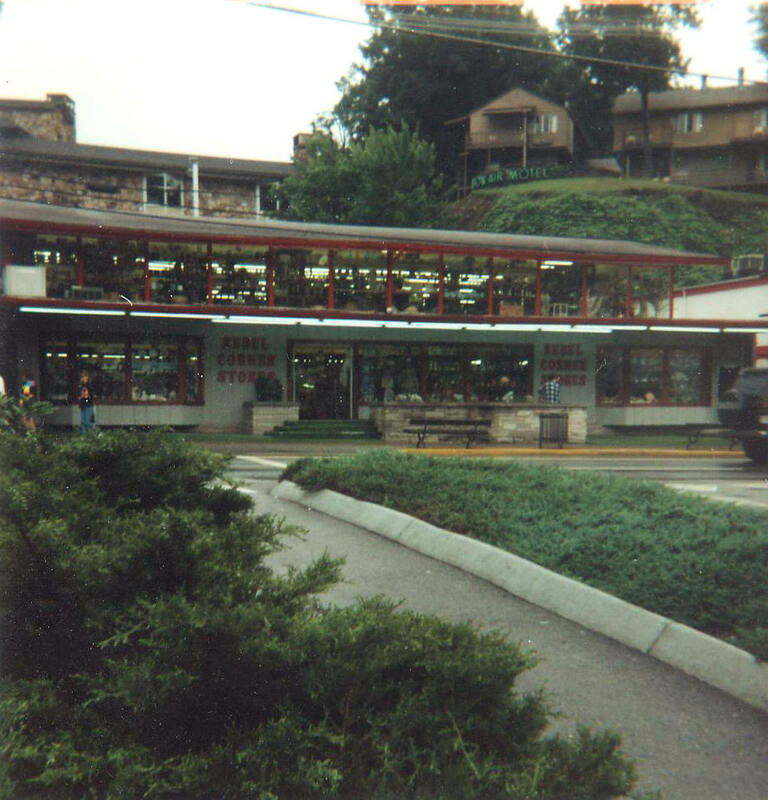 The photo on the left shows Bershire's Old Fashioned Frozen Custard. It was in business in the early 2010's and was located near Elk's Plaza. It went out of business sometime around 2015. 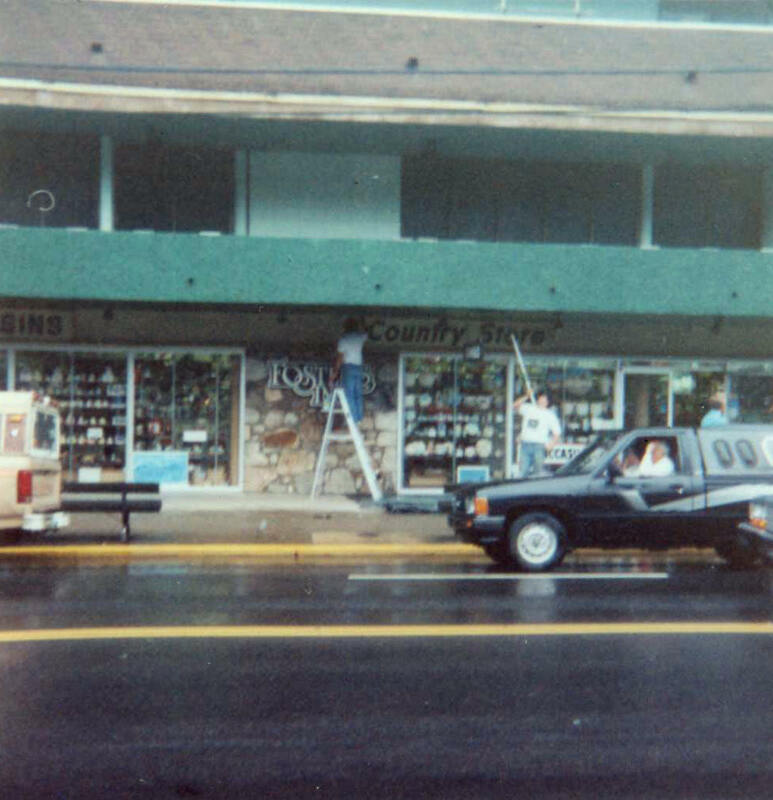 The photo on the right shows T's and Togs which was a T-Shirt shop that existed for quite sometime in the Ober Gatlinburg Mall. It went out of business probably around the mid-2010's. Sometime around the early 2000's, Gatlinburg once again had a wax museum for the first time since the late 1980's or early 1990's I beleive. The Hollywood Wax Museum openned on the corner of the new Linberger's Mall or Dogwood Plaza. The photo on the left shows the Hollywood Wax Museum in the evening. The photo on the right shows that the Mellow Mushroom Restaurant had moved into the Hollywood Wax Museum, probably around the early 2010's, after it had moved to Pigeon Forge.